A sinkhole can be defined as the depression in the Earth surface caused by the collapse of the surface layer or can be many other reasons. It can vary from 3.3 to 2,000 ft. both in diameter and depth. They are located all around the world. So, here we are listing 10 biggest, strangest and amazing sinkholes in the world. The sinkhole is located off the coast of Belize. It is one of the largest submarine sinkholes around the world. The reason for the formation of the hole is quaternary glaciation that has started over 150,000 years ago. The sinkhole is almost circular in shape measures upto 300 meters and approximately 108 meters deep. The largest sea-hole in the world refers to the caves that were submerged when rising waters covered them. Located in offshore of Belize City is one of the favourite points of divers because thousands of stalactites and stalagmites can be explored that were formed when the Blue Hole was an aboveground series of caverns. It is a UNESCO World Heritage Site that is a part of a vast barrier reef (second-largest barrier reef in the world) after Australia’s Great Barrier Reef. It is one of the most popular sinkholes in the world. Located in Russia, the sinkhole has tripled in diameter in last 10 months and is now 120m (400ft) across and up to 80m (250ft) deep. The exact region of the sinkhole is not known, however, the scientist thinks that it is related to potash mine, the largest in the world, which uses seawater. Approximately 12,000 people have to evacuate their homes because of this sinkhole and move to new places. The sinkhole is 80m in length and 40m wide. It is approximately 200 meters deep. If the sinkhole increases further it will eat up the rail line that connects to the potash mine. The experts from Russia are working to fix the issue as the mine is responsible for 10 per cent of the supply of potash in the world. One of the huge sinkholes in the world, Sima Humboldt is located in Bolivar state in Venezuela. The incredible sinkhole can be found in Venezuela, South America with a pair of two smaller sinkholes in the same area. Sima Humboldt is over 1,000 feet deep and the Sima Martel is over 800 feet deep. Both these sinkholes situated on the forested tepui i.e South American tabletop mountain and there is a natural layer of forest in the bases itself. One of the most amazing sinkholes known for its enormous size and depth also because of the weathering pattern that formed the sinkhole. The sinkhole is named after explorer and scientist Alexander von Humboldt. There is a town in Israel named Ein Gedi. It a home to many sinkholes. There are approximately 3,000 open sinkholes around the coast. The researchers told that there can be twice as many sinkholes which are not discovered as yet. The reason for the holes is the shortage of the water in the area. There are many chemical factories in the area which can even worsen the situation. The dead is a lake situated nearly 1400 feet below sea level and hence it is one of the deepest places on Earth. It has a high concentration of salt water more than 10 times than the Atlantic Ocean and is a home huge quantity of trapped minerals deposited over a period of time. The primary reason for the formation of these sinkholes are man-made activities, however, these sinkholes can also form naturally. The change in water-drainage patterns and developing new water-diversion systems are one of the reasons that cause the ground to collapse and hence forming sinkholes. This is what exactly happening in the dead sea. This is the world deepest underwater sinkhole around the world. It is located on the Long Island in the Bahamas. It is circular in shape have a diameter of approximately 25 to 30 meter. William Trubridge on 14th December 2010 made a free dive in the sinkhole. He swam to a depth of 101 meters by using his hands and feet. The best part of the amazing sinkhole is the beach that surrounds the area. It is enclosed on three sides with the natural rock amphitheatre and on the 4th side, you will experience a turquoise lagoon and powder white beach. The water of the sinkhole is extremely clear and you even see clearly till 100 feet. The total depth is 663 meters making it the deepest places in the world. The opening diameter is about 25*35 and as you will go deeper the diameter reaches upto 100 meters. The name “Dean Blue Hole” comes from the local landowners. 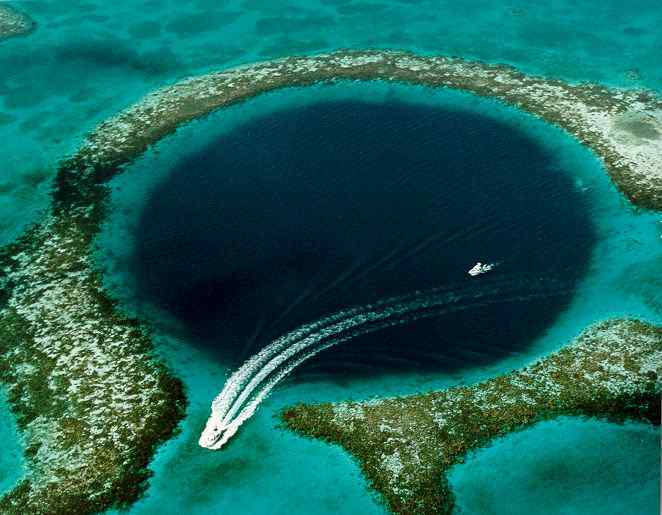 There are several other blue holes located in different parts of the world namely the great blue hole in Belize, blue hole in Dahab Egypt, Blue hole in Gozo island Malta and list goes on. The sinkhole is located in the Abel Tasman National Park in New Zealand. The sinkhole is 50m wide and has an overall depth of 357 meters. Abel Tasman is a very popular national park in New Zealand, and one of the best sea locations in the world. The huge hole is connected to Starlight Cave with its entrance on the top of Takaka Hill. The place knew as headwater retreat because the place where the stream goes underground retreats closer and closer to its headwaters over the span of time. The cave was discovered by the researchers in 1994 during the search of new exploration site for British cavers in the China Caves Project, however, the cave was well known since ancient times. There is a small village known as Xiaozhai near the sinkhole. The meaning of the name is “little village” but the village is abandoned now. The huge hole is 626 m long and 537 m wide and total depth is approximately 511 – 662 m and area of the opening is around 274,000 m², volume – 119.348 million m³. One of the amazing sinkholes has nested structure where the upper bowl is 320 m deep and lower part is 342 m deep and between these steps, there is sloping edge and this ledge is formed due to muddy, “dirty” layer in limestone. The sinkhole is located in Oman. The landscape is very beautiful and it is around 30m deep. One of the deepest sinkholes around the world has been formed in limestone by the collapse of large cave chamber, however, earlier it is believed that the sinkhole has been formed by a meteorite (“piece of Moon”). It is 50 by 70 m large and 20 – 30 m deep. At the bottom of the cave, there is a deep blue-green lake with a heap of rock. The municipality has developed a park around the sinkhole and there is a concrete stairway leading to the lake. The tourist enjoys a refreshing bath in the lake. The top layer of the lake crystal clear, however, at the depth of 8m has a sulfuric taste due to sulfur-oxidizing bacteria and water is less clear. The sinkhole is located near Florida. The landscape is very beautiful as it is surrounded by beautiful trees. The visitors enjoy the sinkhole filled with a small lake and people even jumps for a swim. The sinkhole is generally an original site for a limestone dig near Hawthorne, Florida. Additionally known as “Devil’s Toilet Bowl” by the locals is one of the best spot for an afternoon dip. The lake is equipped with a rope swing and you all can enjoy jump from these ropes. The sinkhole is surrounded by vegetation, however, visitors enjoy a jump in the small lake and go for a swim. These are the 10 most amazing sinkholes in the world. Do post your comments.